There seems to be an issues with VMware vSphere where at a certain point virtual machines show multiple addresses even though they shouldn’t. In this article I’ll show you what is happening, how you can fix it with a workaround and provide you with the most viable solution at hand. The issue is shown in the next screenshot, after a reboot of the virtual machine suddenly my connection with the virtual machine stopped. It didn’t happen just once but several times during the day. Strange thing was that the domain controllers seemed to be more affected than other server. 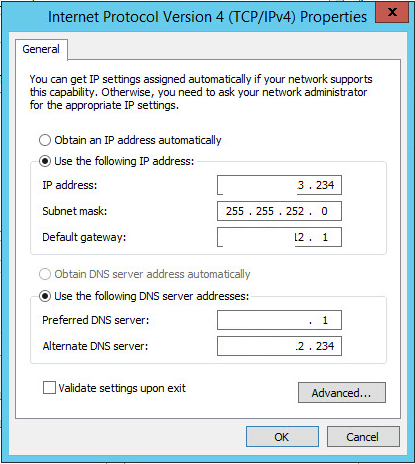 As you see below behind the topic Ethernet it says Multiple IP addresses. If we look at the details we see that next to the fixed IP address I assigned to the server another 168.254 address is assigned to it out of the blue. I sure you that was not my job. So I was kinda baffled because there is only one nic available so who has this IP address attached to it? 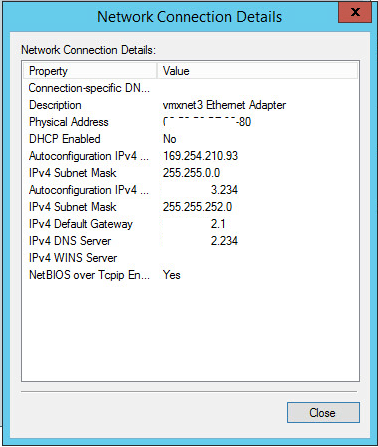 If we open the properties of the Network card you see that there is a fixed IP address assigned, no DHCP going on here. This is my domain controller that needs a fixed address.Ever field is filled so Windows could not be mistaken and think lets assign a 169.254 address. Also I checked the advanced settings to see if the address was listed there, still no luck. you start wondering, it says there is a 169.254 address assigned but you can’t find it anywhere, no configuration is wrong so where is it coming from. We had this issue for a couple of days and it was pretty annoying as we almost surely knew that rebooting a virtual machine would make it impossible to reach it without going through the vCenter server. 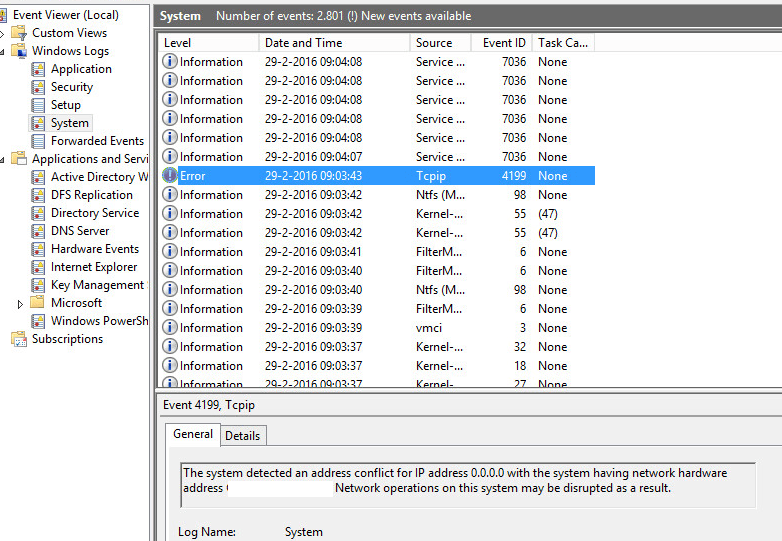 A last attempt to understand the issue led me to the event viewer. 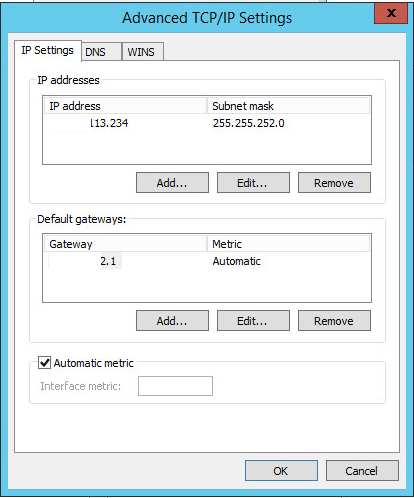 In the event viewer there is an entry that says there is an IP conflict with address 0.0.0.0. That’s kinda strange isn’t it? 0.0.0.0 where is that coming from? The servers have fixed addresses, no server has 0.0.0.0. At least no server after they are booted has that address, of course when VMware is playing with them they might just have 0.0.0.0 for a moment. That might be a hint, the hint I was looking for. After this operations are as normal and the virtual machine is reachable again. It’s a workaround so not one that you would like to handle on a daily bases. I was looking for a solution and saw that there was a knowledge base article at VMware that talks about this. VMware Horizon Air Hybrid mode is coming where does that leave Citrix?